MCA of the Beastie Boys has died of cancer at 47. Posted in art, news, NYC. One or more of you may have had this directed at you. But what does the speaker mean by it? Presumably the speaker believes that the listener is not acting according to some given standard. However, if the speaker had an argument to that effect, the speaker should’ve presented it. Hence, all the above statement means is that the speaker has run out of arguments and has resorted to name-calling: being unreasonable is another way of saying crazy. Now, though, the situation has reversed itself. It is not the listener that has acted unreasonably, but the speaker. Without an argument that concludes that the listener is being unreasonable, then it is not the listener that is being unreasonable, but the speaker. The speaker is name-calling, when, by the speaker’s own standards, an argument is required. For what else is reasonable but to present an argument? So, by saying that the listener is being unreasonable, in essence the speaker is declaring themself unreasonable. But, yet again, the situation reverses itself. If a person has run out of arguments, and makes a statement to that effect, then he or she is being perfectly reasonable. This returns us to the beginning! Therefore, by making a claim about someone else being unreasonable, you paradoxically show that you yourself are and are not reasonable, such that if you are, then you are not, and if you are not, then you are. Posted in argumentation, logic, philosophy. Tagged with argumentation, philosophy. Welcome to the one hundred forty first philosophy carnival. 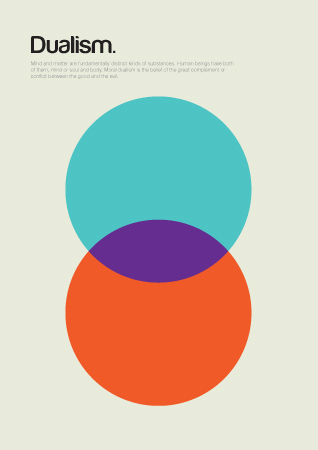 In my internet travels I found some really cool philosophy inspired posters by Genis Carreras, which I have paired with the links to pretty up the carnival. Zombies, because philosophers like zombies. 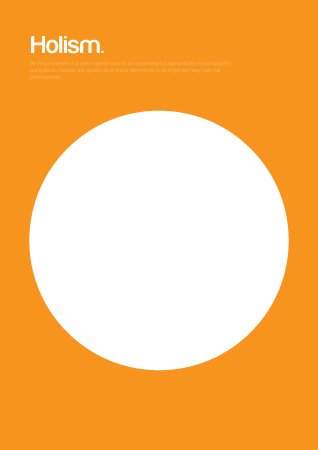 Jason Zarri at Philosophical Pontifications posts a more in depth post on the consciousness of a scattered zombie brain. See what happens if at first we have zombie brain, except that this brain is made of people working all over China to simulate brain activity. What happens if parts of the brain (people) are replaced by neurons, ending up with a normal (if scattered) brain? Professional level zombie discussion! Richard Brown vs. Dave Chalmers, with Dr. Brown discussing the use modal operators when arguing for the conceivability of shombies (a subspecies of zombie). This discussion goes from possible worlds to identities, and leads to a revised argument which concludes that non-materialism is false. Go check out the argument! This is my favorite post of the carnival: U-Phil: Deconstructing Dynamic Dutch-Books? by Deborah G. Mayo. It is about dogmatism in Bayesian epistemology when considering Dutch Book arguments, as viewed by a frequentist. This is great stuff. Is There a Difference Between Memory and Imagination? Ok, this has little to do with dogma, but I had nowhere else to put it. Greg argues that remembering is closer to imagination since it is a reconstruction. Tomkow proposes that philosophical experimenters need to take more care in separating their philosophical intuitions from biasing their results. This makes me wonder if there are further chances for a philosopher to bias their test subjects beyond psychological factors– can philosophical opinions be projected in new and unusual ways beyond what we account for? 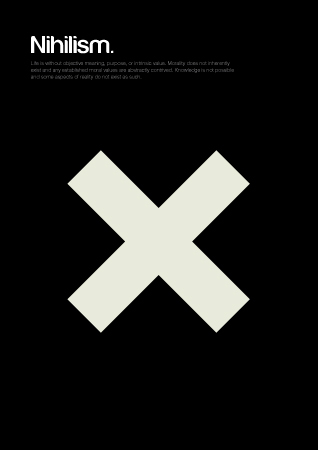 What happens when people are placed under linguistic constraints and need to communicate? 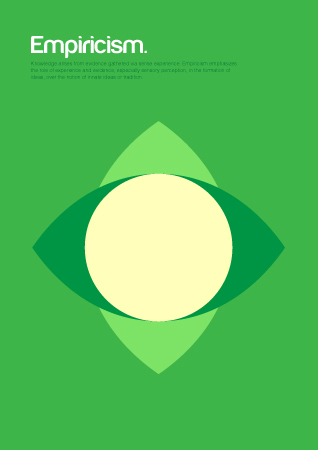 Experimental semiotics provides some insight with combinatoriality (recurrence of basic forms), but Gualtiero Piccinini argues that natural language is more complex. He says it requires potential infinite complexity, which may not occur with only combinatoriality. Still, ES leads him to hypothesize the “Gavagai Game” of language generation, which could provide insight into language. James Armstrong discusses a humanistic approach to the basis of certain rights, namely the right to freedom of movement. The argument is grounded in “the right of individuals to live a minimally decent life,” justifying a strong position on immigration. Richard Chappell, however, outlines a position where acts are evaluated on utility, not the character of the person doing them. By evaluating acts and not the person’s character, individual accidents of psychology which may make one person much more (in)sensitive to certain issues than others may be separated from their moral will. He argues that this position is highly practical. Gregory Wheeler has an interesting set of posts about sampling problems in our favorite school ranking system, the Philosophical Gourmet Report: The Sampling Problem and Educational Imbalance. Murali at the Leage of Ordinary Gentlemen argues for a basis of law on a two tier system, the distinction between habit and rule following, and an internal point of view. Dave Maier discusses semantic rule following in Wittgenstein. This is actually a really good discussion of how we get caught in a bind of wanting both definitions and revisability when it comes to identifying fundamental measures, but I’m actually posting this because I want to point out that my duckrabbit is better (and more stylish) than his duckrabbit. My duckrabbit should be the standard duckrabbit. And what if my duckrabbit were to significantly change? Would we have to revise all other duckrabbits to account for the change? Of course not. 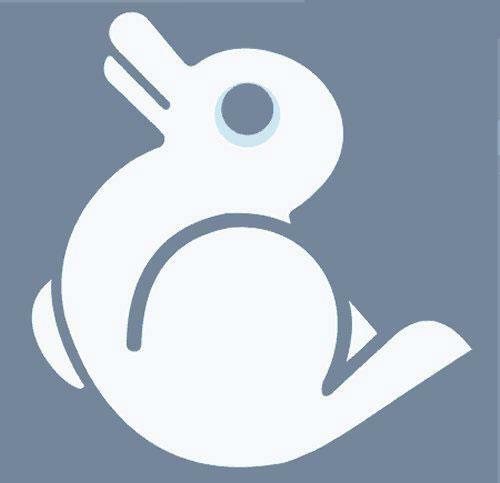 Since it is so inconceivable that my duckrabbit should become fundamentally different, if it were to change, it would signify that we had lost our minds. So there is no problem here at all. 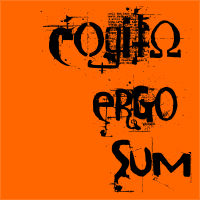 Another article by Dave Maier, What is philosophy, again?, but this one over at 3 Quarks Daily. My contribution to the carnival is that I am starting a new blog, The Road to Sippy Cups. My inaugural post is I Sneeze, Therefore I Am. I say on the about page, “Philosophy’s goal is to wean us off ideas — even if they had sustained us — because those ideas no longer provide us with what we need, and, hopefully, onto better ones.” And I will be writing, “metaphysics with an eye towards values, humans and society.” So I encourage you to go check it out. … you might be an internet philosopher! 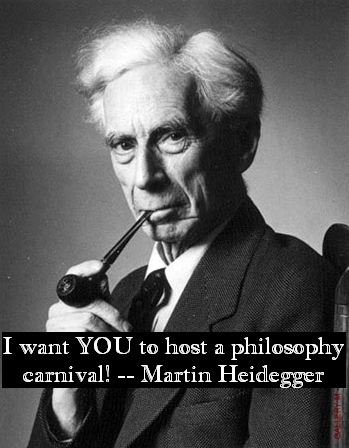 So go over to the philosophy carnival page and sign up to host or submit your work! Posted in fun, internet, philosophy. Tagged with carnival, philosophy carnival. 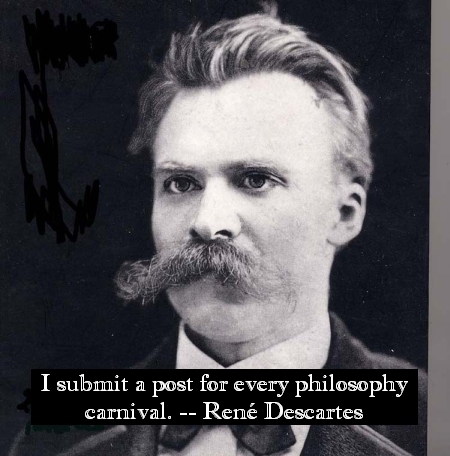 I’ll be hosting the next philosophy carnival, so please submit some fun links over at http://philosophycarnival.blogspot.com/. Posted in fun, internet, philosophy. Tagged with carnival, philosophy. At least since Selten (1975) game theorists have considered that given a series of decisions there is some small probability that the person making the decisions will make a mistake and do something irrational, even if she knows the right thing to do. This is called the trembling hand approach: although a person rationally knows the right (rational) thing to do, sometimes her hand trembles and she chooses incorrectly. Therefore, given a game defined by a finite set of iterated decisions and payoffs in which all the rational moves are known by both players (think Tic Tac Toe), there is a ‘perturbed’ game in which the rational choices are not made. So consider playing a game of Tic Tac Toe: Either player can always force a draw in Tic Tac Toe and hence prevent loss. However, it is easy enough to make a mistake (through inattentiveness, eg) and allow your opponent to win. I believe this approach is a good start but does not go nearly far enough to incorporate probability into game theory. The issue stems from the trembling hand approach assuming that irrational behavior occurs because of ‘some unspecified psychological mechanism.’ This is fine, but then every trembling hand probability, every chance of making an irrational decision, is defined as a separate, independent probability. This means that making an irrational decision is based on chance, as if we roll a die every decision we make. The probabilities of making mistakes would not be independent of each other, since they have a common source. There would be a much higher chance of irrationality at times when the psychological issue manifests itself. Hence it cannot explain why someone would crack later in the game as opposed to earlier, since all the probabilities are equal. Nor can it explain why people make irrational decisions at higher rates when playing against a crafty opponent than they would make otherwise. Therefore the trembling hand model cannot explain the effectiveness of gamesmanship. This model has an increasing chance of irrational action. As time progresses, it becomes increasingly likely that an irrational choice will occur due to the gamesmanship of the opponent. I’ll refer to this model generally as induced irrationality. Induced irrationality occurs when the chance of making a rational decision decreases due to some factor, or when the chances of making irrational decisions over time change in concert, or both. Other phenomena follow this pattern. Bullying comes to mind: it is similar to gamesmanship in its breaking or bending of ‘rules’ over time to get in someone’s head and thence get them to do things they would rather not do. The bullied will act irrationally in the presence of the bully and potentially more so as the bullying continues, perhaps even leading to “snapping”— doing something seriously irrational. Phobias are also similar: for whatever reason a person has a phobia, and given the presence of that object or situation, the otherwise rational person will make different decisions. Moreover this may have something to do with the Gambler’s Fallacy: By making a gambler associate a pattern to some random act, such as by showing the gambler all the recent values of a roulette wheel in order to convince the gambler to believe that the wheel likely will land on red (or losing a few bets to a shill in 3 card monte, or seeing a pattern in the stock market, etc. ), the casino has planted a belief in the gambler. Hence, as time goes on and red is not landed upon, the gambler increasingly thinks it is ever more likely that red will hit (even though it has the same low chance as it always did). Hence the gambler will likely bet more later — more irrationally — as he expects red to be increasingly likely to hit. Hence, though trembling hands may be a factor in irrational decision making, it does not seem like it is the only possibility or even the most significant in a number of interesting cases. Selten, R. (1975). 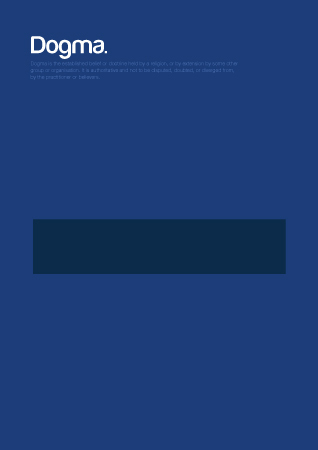 ‘Re-examination of the Perfectness Concept for Equilibrium Points in Extensive Games.’ International Journal of Game Theory, 4: 22–55. My brother beat the Tic Tac Toe playing chicken when the Chinatown Fair Arcade (NYC) still operated. I assume that there was a computer choosing the game moves and it happened to glitch when my brother was playing: though the machine claimed it won, if you looked at the Xs and Os, my brother had won. We asked the manager for our promised bag of fortune cookies. He said he didn’t actually have a bag since the chicken wasn’t ever supposed to lose. Posted in economics, game theory. Tagged with economics, game theory. Posted in ethics, philosophy, products, technology. Tagged with ethics, Matrix, philosophy. There are different sorts of constraints on thought. We forget things, we fail to infer consequences of our beliefs and we have features of perception, like blind spots, that affect our understanding of our surroundings. We also can be greatly affected by our emotions: when we are angry — when we see red — we are unable to see the anything but the things that are making us mad; when we are infatuated we are, conversely, unable to see anything wrong with our object of desire. This account of emotional states — moods — is interesting because moods affect our overall reasoning ability. Given one mood, we will be able to make certain inferences; given another, we will make different inferences. Moreover, what seems to be a rational inference in one mood may be irrational in another mood. 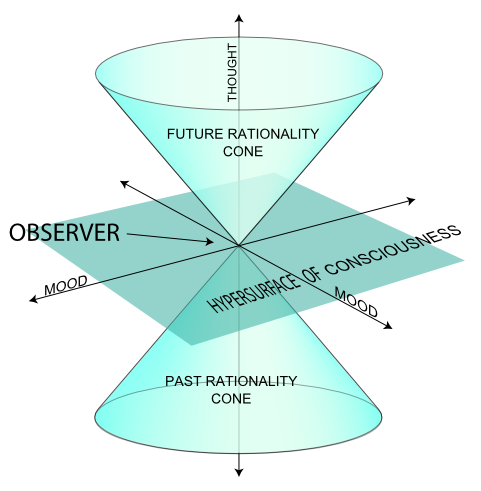 The Future Rationality Cone illustrates how, given changes in thought or mood, a person’s beliefs can become different from their current beliefs. The edge of the cone is the limit of what that person could possibly rationally believe: anything outside the edge requires too great a jump in thought or mood from where they currently are. 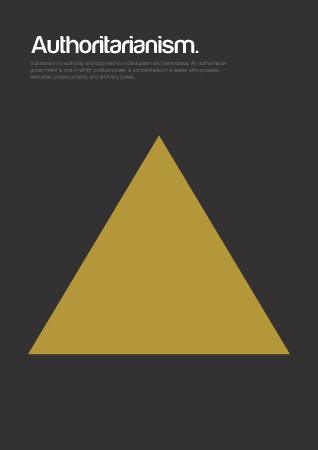 Any point inside the cone represents a set of beliefs that the person could rationally have, given different circumstances. The bottom half of diagram shows the past rational states that could have led up to the current state, as represented by the Past Rationality Cone. If the above scheme is familiar, it is because it is modeled on the Light Cone from physics; the diagram is from the linked Wikipedia page. I always found it fascinating that the light cone implies that there is part of the universe immediately surrounding each of us that we can never physically access. Likewise, there are thoughts and moods that are just like our own that appear irrational to us—even if they are not—because they fall outside our capabilities. Other people could, however, have these thoughts because their rationality cones are not exactly aligned with our own, or they started from another location, which enabled them to access that part of the mental universe. Posted in metaphysics, mind, philosophy, physics. If we try to represent tossing a coin or a die, or picking a card out of a deck at random, in logic, how should we do it? such that ‘Toss’ represents a random selection of the given object. Then x would be a function of y: we would select x with respect to y. The problem is still that a Toss involves randomness. So this setup is incorrect because treating x as a function of y is not randomized, because y is not random. How can we represent randomness in logic? As noted, functions alone will not work. 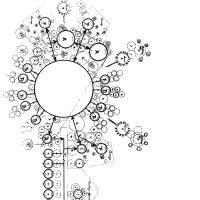 Variables and interpreted objects cannot invoke randomness. Perhaps we can modify some part of our logic to accommodate randomness. The connectives for negation and conjunction haven’t anything to do with randomness either. But, if we use the game theoretic interpretation of logic, then we can conceive of each quantifier as representing a player in a game. Players can be thought of as acting irrationally or randomly. Therefore, let’s introduce a new quantifier: Я. Я is like the other quantifiers in that it instantiates a variable. However, Я is out of our (or anyone’s) control. It does instantiate variables when it is it’s turn (just like other quantifiers) but it instantiates randomly. So we have three players, Abelard, Eloise and Random (or the Verifier, Falsifier and Randomizer). But more is still needed. We need a random selection between specific options, be it between heads and tails, 1-6, cards, numbers, or anything else. One way of doing this would be to create a special domain just for the random choices. Я would only instantiate from this domain, and if there are multiple random selections, we will require multiple indexed domains. represents a coin flip since Я randomly instantiates out of the domain containing only Heads and Tails. 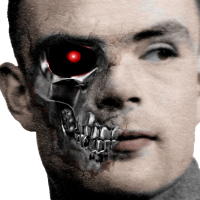 Now that we have an instantiation rule for Я we also need a negation rule for it. If some object is not selected at random, then it must have been individually selected. In this case the only other players that could have selected the object are ∀ and ∃. Hence the negation rule for Я is just like the negation rule for the other quantifiers: negating a quantifier means that a different player is responsible for instantiation of the variable. If neither player is responsible, it can be considered random: ¬Яx ↔ (∀x or ∃x). We can leave the basic negation rule for ∀ and ∃ the way it is. Therefore, given the additions of the new quantifier and domain (or slash notation), we can represent randomness within logic. 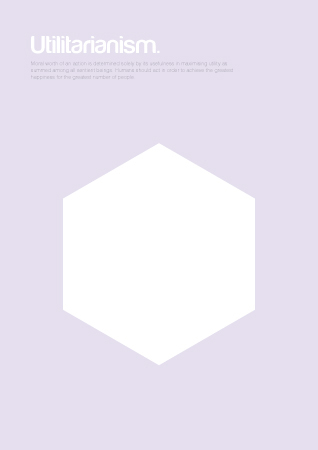 See “Propositional Logics for Three” by Tulenheimo and Venema in Dialogues, Logics And Other Strange Things by Cedric Degremont (Editor) College Publications 2008, for a generalized framework for logics with 3 quantifiers. Since the above logic requires either indexed domains or dependence operators, Яandom Logic is a bit different, but it is a good discussion. Posted in game theory, logic, science. Tagged with independence friendly logic, logic, measurement, random, random logic. Posted in news, NYC. Tagged with NYC. In The Genial Gene Joan Roughgarden seeks to replace the competitive understanding of evolution, known as sexual selection, with a cooperative one. 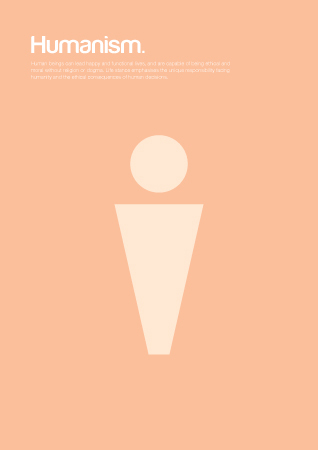 The first sentence of her book reads, “This book is about whether selfishness and individuality, rather than kindness and cooperation, are basic to biological nature” (p. 1). So what is the argument? Taking this first line, she wants to conclude something about basic biological nature. To do this, one can either define what basic biological nature is and then use that definition to derive conclusions, or else survey the natural world and find the best interpretation for whatever empirical results were found. She opts for the latter strategy. To this end she first surveys and compiles examples of what people consider to be evidence for sexual selection and argues that this evidence has been misconstrued or simply does not support the theory of sexual selection. Then she offers a few logical arguments against sexual selection with the aim to highlight contradictions within the theory. She then develops her alternative, called Social Selection. Social Selection is fundamentally based upon cooperation, not competition, and she proceeds to reinterpret the empirical research with respect to cooperation. Given the results of this reinterpretation, she concludes that the cooperative approach provides a more accurate picture of the empirical data than the competitive approach. Therefore social selection, not sexual selection, is fundamental to biological nature. Can this argument be maintained? Her argument fundamentally turns on the interpretation of the empirical research. (If her logical arguments were strong enough to undermine sexual selection on their own, she would have dedicated more space to them. At best, in my opinion, they could raise questions about sexual selection, but are not inherently damaging enough, even if they are accepted uncontested, to force a major revision to sexual selection.) She interprets the research in terms of cooperation and her opponents are those who interpret the research in terms of competition. Roughgarden claims her interpretation is the correct one. Insofar as she is making an inference saying her interpretation is the best conclusion, her argument fails. She readily admits that the defenders of sexual selection are able to consistently create explanatory fixes for apparent contradictions in the empirical research. Since they are able to explain the data, the fact that she is unsatisfied by their explanations (and likes her own better) is no grounds for convincing her opponents to give up their explanations. After all, they have history and authority on their side. 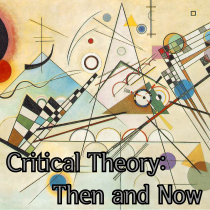 Her coming up with better numbers, that is, having formulas that (she says) more accurately represent the research, is not a sufficient reason for discarding a theory that has held up for many years, especially one that continues to be an area of active research. So, she has not successfully argued that social selection should replace sexual selection. However, if we consider a more modest conclusion, then Roughgarden may be able to maintain part of her argument. She makes the point that the core Darwinian theory does not include sexual selection; it is a later contribution (ppg. 3-4). This suggest that there may be theoretical room for cooperation in addition to competition. But how much room? Now the interpretive problem that she set up cuts the other way. Instead of her trying to convince us that her cooperative interpetation of the empirical research is the correct one, we ask the competitive interpretation why it is the best one. Empirical research alone cannot support one conclusion over another: the data must first be interpreted before a conclusion can be reached. As mentioned above, sexual selection has history and authority on its side, but age and endorsements are not arguments for being the sole fundamental methodology of biological nature. Without history and authority, sexual selection proponents only have their ability to explain bioogical research, which is no more than Roughgarden has. Therefore, advocates of sexual selection have no further theoretical resources to support their claim that sexual selection is the fundamental method working in evolution. This means that Roughgarden does succeed in part. Based on the arguments she provides she is unable to maintain that kindness and cooperation underpin evolution, but she is able to cut sexual selection down to her size. She has shown that it is possible to reinterpret biological research in terms that do not rely upon competition and that sexual selection has no special theoretical privelege. Therefore sexual selection proponents can no longer claim to be fundamental biological reality: even though Roughgarden was unable to fell their theory, they won’t be able to down her either, and so she has established theoretical room for cooperation in Darwinian theory. Posted in biology, evolution, measurement, science. Tagged with biology, philosophy, review, science.